“Holy crap. I have never, in my entire career as an ant researcher, seen *anything* like this,” tweeted Alex Wild, curator of entomology at University of Texas at Austin. 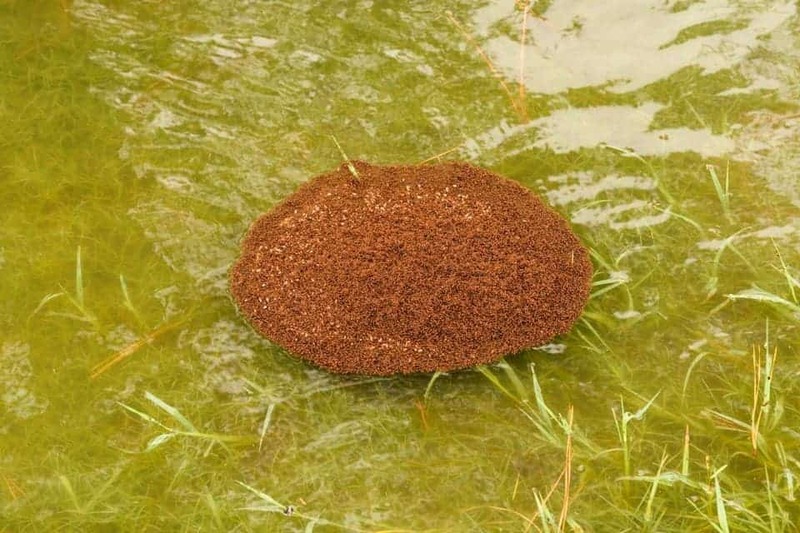 A fire ant raft after Hurricane Harvey in Pearland, Texas. Credits: Brant Kelly / Flickr. Aside from causing tremendous damage and suffering, Hurricane Harvey has also created some surreal images. There’s the alligators floating in yards, people catching fish inside their houses, but few things are as stunning as this adaptation from the Texas fire ants. The create tight rafst from their very bodies, allowing some of the ants on top to walk about freely, taking care of the eggs and what’s left of the colony. When the floods kicked in, so too did the fire ants’ survival instinct. You could see them rising up from their subterranean tunnels, clinging to each other to form a ghastly raft from their own bodies. This isn’t even that bad for the ants. They love water, Wild told The Atlantic. “It’s how they get around.” It’s creepy and it’s got a lot of nightmare material, and it can be quite dangerous — but for the ants themselves, it’s incredibly efficient. According to entomologists, this is not really unusual behavior, it’s just that the scale at which is happening is impressive. Some ants hug each other, taking advantage of their waxy, waterproof bodies to ensure that water doesn’t come through. They do leave tiny pockets of air that allows the raft to float. The queen and the larvae are left on top, where they are most protected, but even the insects on the bottom are not sacrificed. Those pockets of air allow them to breathe, though the process is not as easy. Bottom ants regularly change place with top-level ants, so that they don’t drown. The rafts have been known to last for several weeks before breaking up, so Texans are in for quite a treat. If it gets to that long of a time, however, the ants won’t refrain from eating their young (currently in pupae form) to survive. When they reach land, they will rebuild a new colony, moving back to their ordinary diet of eggs and other insects. They sometimes even eat mammal meat, seeds, earthworms and discarded sweets. Rebuilding the colony is a tough task, but the ants are up to it. Queens may live up to 7 years and can produce up to 1,600 eggs per day, and colonies will have as many as 250,000 workers. Some fire ant colonies have no workers, and they are merely social parasites. 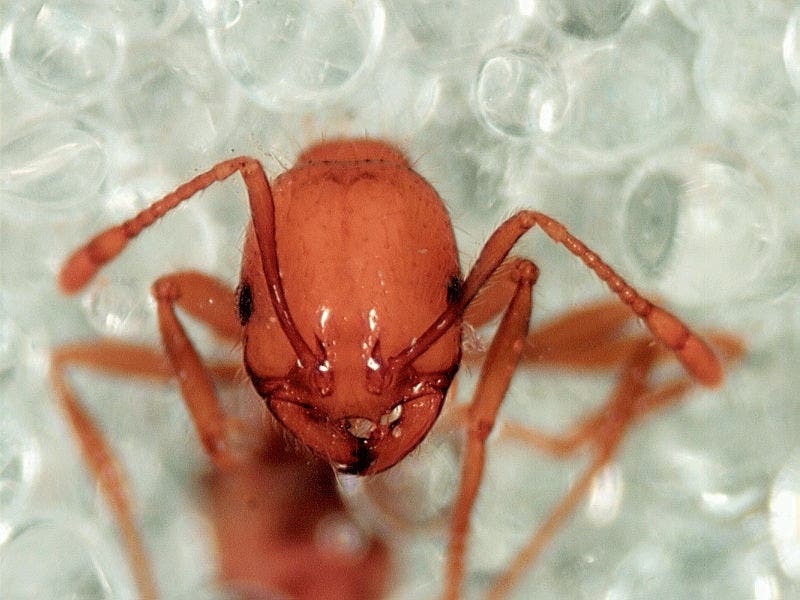 Detail of the head (Solenopsis geminata). Image credits: CSIRO. As tempting as it may be, if you see such a raft, don’t touch it. They’re called fire ants for a reason, and that reason is that their sting hurts like hell. In extremely rare cases, allergic reactions can even be fatal. It’s not uncommon during floods for people who encounter such rafts to be bitten over large surfaces of their body. The ants are also more aggressive during the flood. They are also quite sneaky about stinging you — they can sneak on your leg or hand, not stinging you until they’ve found a hair to attach themselves, allowing them to pack a stronger punch. After one of them stings you first, all of them will sting immediately, at the same time. Yikes! While fire ants are often considered invasive and pests, they do offer one advantage: they love to eat ticks. So while the after-flood will be crawling with all sorts of ticks, once the fire ants get there, they’ll be sure to round them up. The structure of these rafts is being studied by material scientists due to its impressive properties, as can be seen in this video. At points, the entire raft basically acts as a fluid, kind of like Jell-O.